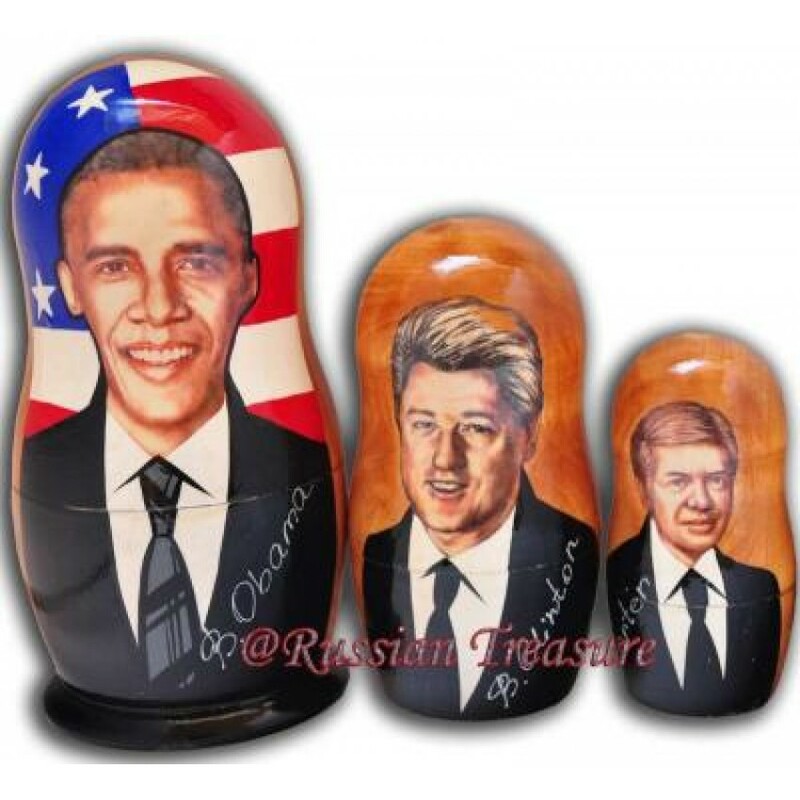 These Matryoshka nesting dolls portray five of the recent US Presidents – Democrats (Obama, Clinton, Carter, Lindon Johnson, JFK). Each Matryoshka nesting doll is hand carved and painted in chronological order to bring an item of the highest quality to the customers of Russian Treasure store. The first and biggest Matryoshka nesting doll presents the image of the current US President – Barak Obama against the stars and stripes of the national flag. The forty second President Bill Clinton is portrayed on the second Matryoshka nesting doll. Jimmy Carter, the thirty ninth President of the United States, is featured on the third Matryoshka nesting doll and is famous for winning a Nobel Peace Prize in 2002. Lyndon Johnson, the thirty sixth President, is painted on the fourth Matryoshka nesting doll. And the smallest fifth Matryoshka nesting doll presents John F. Kennedy, the only Catholic among the Presidents and a winner of the Pulitzer Prize, who was assassinated shortly before the end of his first presidency. Each of these Matryoshka nesting dolls is carefully painted to reproduce the tiniest detail of the Presidents’ personality and this set of Matryoshka nesting dolls will make a perfect gift for a history buff. You can be assured of the highest quality of these Matryoshka nesting dolls, as every single piece of artwork is personally selected from the artists that we have worked with for many years.